There is a single, all-important, overarching concept you need to grasp in order to execute any effective survival plan: you need a continuous, safe, plentiful supply of water. I state this concept first, before a list of rules, because it puts all the rules in perspective in any given situation. To illustrate this, consider this scenario: It’s a stunning October day in Montana, and you’re flying your ultralight plane when a wind gust takes you down 30 miles East of Big Sky, deep in the Gallatin National forest. There’s no cell phone tower in range, no OK, we’ll come back to this. These are good rules. I teach them myself. But before I even get to these rules I drill a global concept into the minds of my students: Treat the gun as if it were a deadly weapon; it’s on the verge of killing someone (maybe you) if you mishandle it. This fact — this concept — is what causes us to delineate the rules in the first place. Understanding the global concept internalizes the rules more effectively. The student who grasps the concept will never forget the rules or treat them casually. Now back to your crashed plane. If I only told you a list of rules (“find water, you need a gallon per day, sterilize it somehow”) you wouldn’t know how to order your priorities. In this case your first priority is not to find water, but shelter. It’s October, and if you die of exposure, finding water that day won’t do you any good the next. Fortunately, you understand the concept of a “continuous, safe, plentiful supply.” This is not something you can take with you everywhere all the time. You understood that this resource requires development. You knew this before you took off, and so you were prepared. You gave yourself the tools necessary to develop that resource. Before you took off in your ultralight, you studied the terrain you’d be flying over. You identified water sources along your route, and you packed a compass and a topo map. That way, wherever you landed or crashed, you’d know how to find your way to water. And because you understood the risks you were taking, you abated them by packing enough water to get you to more water. You see, God designed us to stretch, to grow, and to explore; to develop new skills and learn new things; not to be complacent and passive, but rather to understand the world we live in and improve it. And one of the things we are tasked with is fulfilling our responsibilities to those in our care. In my case, that means I can fly my ultralight if I like, but not in a way that will merely satisfy my personal need for adventure. Rather, I must do it in a way that will get me safely home to my wife and children, who need me for as long as I can live on the earth. The adrenaline rush is cool and stuff, but I can’t selfishly be reckless. Understanding the global concept gave you the context in which to develop a survival plan specific to your situation. The point is that you have to be aware of the situation and adapt to it. Hikers, campers, rock-climbers, dirt-bikers on a trail, even people on a western road trip all face a risk that must be addressed. Now let’s look at the Big Crunch. By this I mean power outages and interruption of water utilities due to natural disasters or political/economic meltdown. This is a risk we all face at all times, always in the background of our daily routine. It’s something we should always be ready for right at home, but how you get ready depends on your specific situation. If you live in a high-rise apartment downtown, you don’t abate that risk the same way you would if you lived on forty acres in the country. Now that we have the global concept, we’ll state a few rules. Stock an emergency water reserve. If your existing water supply is interrupted, you must have time to switch to your contingency water supply. This means you need drinking water stored on your property in sufficient quantities and in appropriate containers. Develop a contingency water supply. Get started right away because it could take weeks or months to develop. Test your contingency plan. It is critical to troubleshoot your system ahead of time and work out the kinks when your life doesn’t depend on it. Rehearse. Make it a family project — fun for the whole family. Figure you need one gallon per person per day just to stay alive, more if you’re active. If possible store more than this for personal hygiene, which is important for morale and comfort. Don’t overlook the importance of these in survival situations. Store the water in appropriate containers. Pure water is sterile, and if stored properly will last for centuries. Educate yourself. Some plastics will eventually leach possibly toxic substances into your water, so test it — and taste it — occasionally. Rotate the supply. Light accelerates this process, so keep it in the dark. Clear glass makes an excellent container. Clay and stone are good too, as long as they are not contaminated with heavy metals. Again, do your research. Keep a filtration system. I use the Big Berkey. 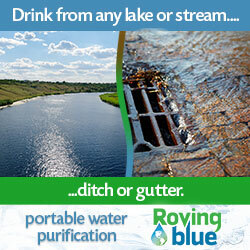 You can run your stored water through it and have safe water that way. If your main supply runs on an electric pump, consider it vulnerable. The best contingency supply is a spring. Next is a shallow well that doesn’t depend on electric pump. Flowing surface water (a creek or river) is better than standing water (a pond or lake) but both of these sources might need to be filtered. Know the pattern of your water supply. Water supplies fluctuate seasonally. If necessary, build a cistern below your spring, or build a dam in the creek to get your through the dry season.With good planning even a trickle of water can yield all you need throughout the year. Above all, understand that all of this development must be done ahead of time. And if the big crunch never comes, you can still benefit by just going ahead and switching to your independent supply. You don’t really know what’s in that public utility water. I can’t even stand the taste of chlorine anymore. Do the work now and rest easy.